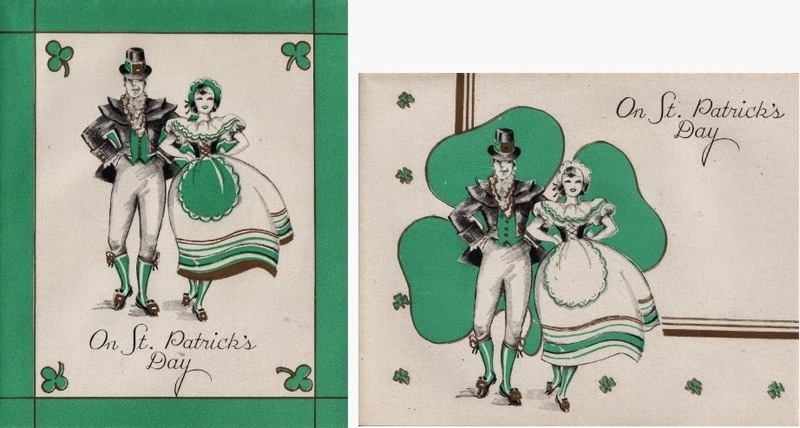 Several years ago I found an almost full display box of vintage Saint Patrick's Day cards. 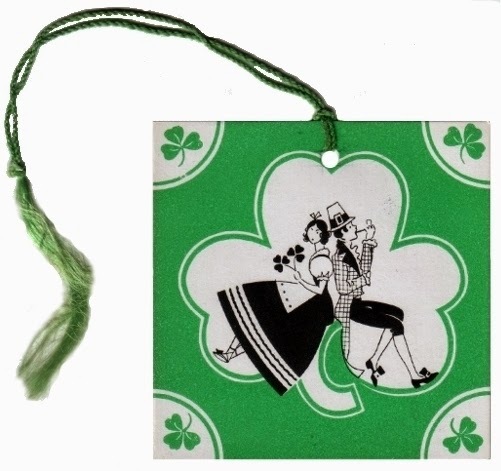 It would have been displayed on the counter along with other Saint Patrick's Day merchandise. The top of the box opens up and the folds back to create a stand at the back for promotional material. Here are the different cards that are in the box. Click on the images to get a better look at the designs on the cards. It is interesting that eight of the cards are based on four designs. They are all printed in black, green, and gold on white paper. This is the same dancing couple but with different background treatments. The card on the left opens on the right side while the other card opens at the bottom. 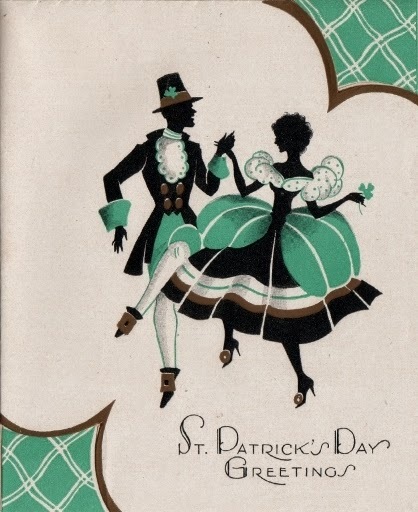 This dancing couple is done in a stylized silhouette. 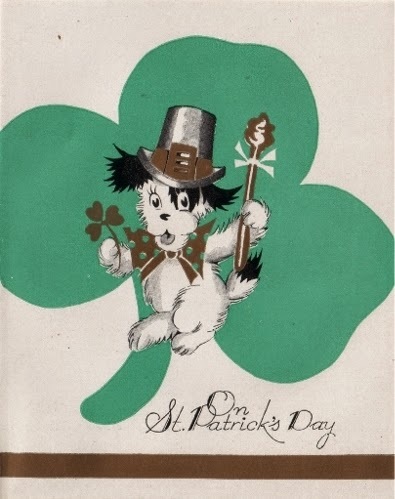 The card is cut away on the front along the gold edge at the top right corner and at the bottom left corner to show the white and green cross hatch design on the inside of the card. This is the same donkey cart image just turned slightly to give the appearance of going down a hill. 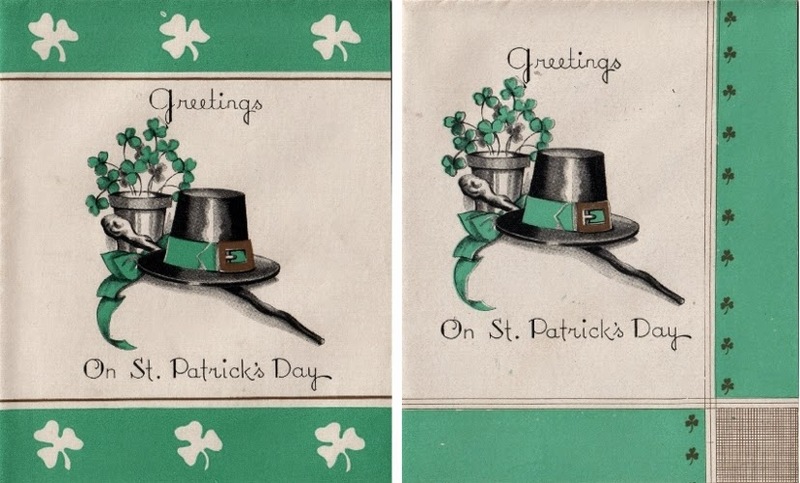 The card on the left is die-cut along the edge of the shamrocks to reveal the green, gold, and white stripes printed on the inside of the card. The card on the right has no die-cut detailing. It is interesting to see the changes done to the backgrounds of the images as well as the introduction of die-cuts on some of the cards and how different in feel they are to each other. The card on the left has no die-cut detailing. 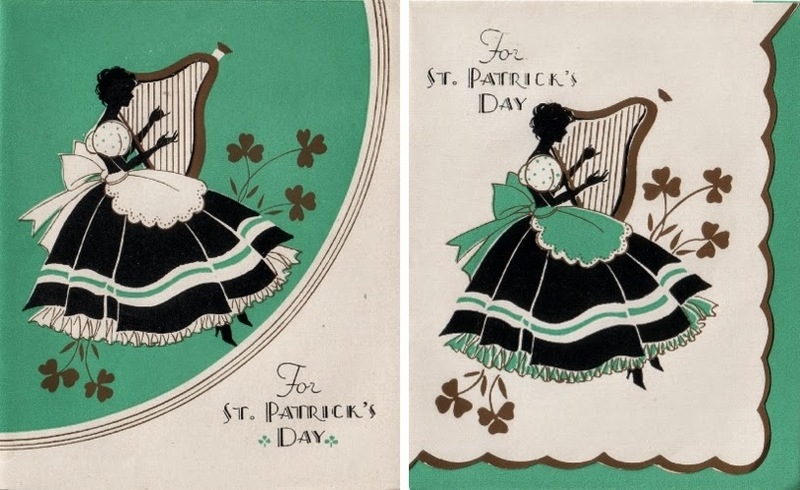 The card on the right is die-cut along the edge of the gold scallops to reveal the green printed on the inside of the card. This cute card is intended for a child. It is printed on the front with no die-cut involved. Both of these cards are printed on the front and neither card is die-cut. All of these cards are printed on the back with a simple "Made in Canada"at the bottom centre of the card. This bridge tally and the one following are marked on the back "Gibson Cinti USA". They have a fairly similar appearance to the Canadian cards but I believe that they may be earlier. 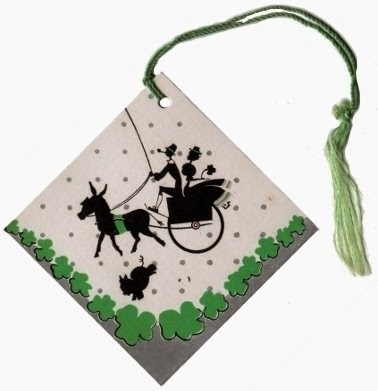 This bridge tally is printed in green, black, and grey with just a touch of gold on the hem of her skirt, the wheel hub, and the wooden part of the cart that attaches to the donkey. I have no idea what that is called! These napkins are by C. A. Reed Company of Williamsport, Pa., USA. The image on the left shows the pack of napkins with the label that reads - 24 Reed's napkins 12 1/2" x 12 1/2". That paper label is beautifully designed as well. The image on the right is a scan of a single napkin. where do you find these goodies???? You must have the luck of the Irish! About 8 or 10 years ago it was very easy to find this stuff in the thrift shops at unbelievably low prices in Victoria but unfortunately now there is not as much available that is really interesting. 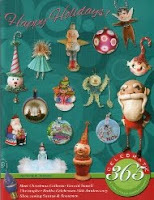 It is available at the flea markets and collectible stores but at a much higher price. I also have a friend that is always looking out for stuff and surprises me with items.